This is a scene from the movie "War for the Planet of the Apes." The Catholic News Service classification is A-III -- adults. The Motion Picture Association of America rating is PG-13 -- parents strongly cautioned. Some material may be inappropriate for children under 13. 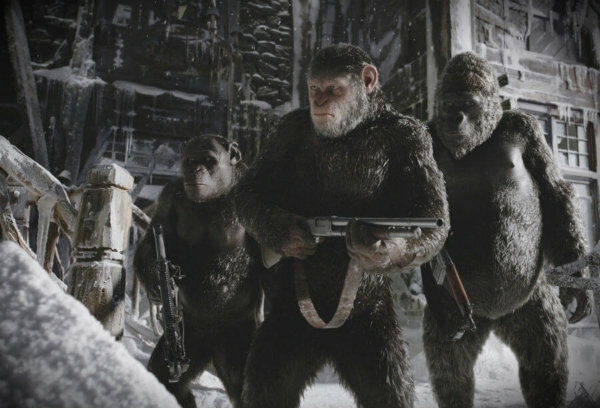 NEW YORK — Monkey business turns deadly serious in “War for the Planet of the Apes” (Fox), the climactic installment of the rebooted film franchise based on the work of French science-fiction author Pierre Boulle (1912-1994). The film contains frequent stylized violence, two uses of profanity, and a subtle anti-Christian message. The Catholic News Service classification is A-III — adults. The Motion Picture Association of America rating is PG-13— parents strongly cautioned. Some material may be inappropriate for children under 13.